Member set out from Lordenshaws near Rothbury. Thirteen members of Morpeth Footpaths Society set out at 10.30am from Lordenshaws near Rothbury on a sunny Sunday for a triangular, rather than circular walk, over the Simonside hills. The leaders guided the group clock wise round the route. Leaders David and Elaine Sayer guided the group clockwise round the route, over moorland taking in Spylaw and Coquet Cairn, through woodland with fallen tree climbing challenges, and a marshy patch towards Selby’s Cove (named after an infamous 17th century robber) for lunch. Due to deforestation, the trek towards the foot of the Simonside ridge was quite tough, but markers for St Oswald’s Way kept prompting the correct direction. The steep path to the summit is well paved and was well worth the effort as the views are spectacular. In an effort to prevent erosion, the ridge has been well paved and was easy to navigate back to the car park. 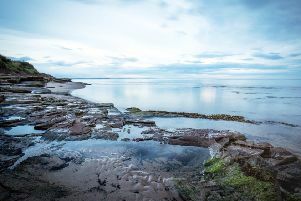 Our next walk is on Sunday, June 10, when we will meet for a three-and-a-half hour (six mile) circular walk to Craster. The route takes the ‘Long Walk’ through Howick Hall gardens, for which there is a £7 charge (£6 over-60s). A beautiful walk through the arboretum leads to the coast, which is followed to Craster. We then loop back inland via some possibly muddy sections. No hills. Meet at 10.30am, at Howick Hall car park. Call 01670 505202 if you wish to join us.